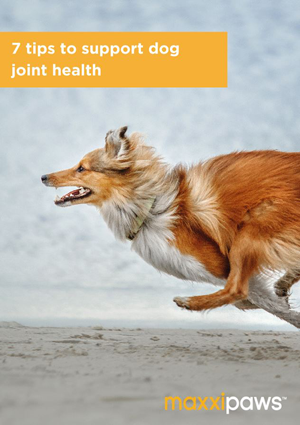 Dog joint health problems can be divided into two categories, developmental and degenerative joint problems. Developmental joint problem is when the joints do not develop correctly, e.g. like is the case with canine hip dysplasia. While degenerative joint problem is when the condition increasingly deteriorates over time, e.g. due to normal wear and tear. Arthritis is the most common degenerative joint problem in dogs. Actually, most dog joint problems manifest themselves in some form of dog arthritis. This article gives an overview of the most common dog joint health problems in alphabetical order. The word arthritis comes from Greek and means joint inflammation. The classical definition of arthritis is a joint disorder that involves inflammation of one or more joints. Dog arthritis is very common, it is estimated that around 20% of all dogs suffer from it. Canine arthritis is most commonly seen in older dogs, i.e. from years of wear and tear on the joints. Dog arthritis risk factors include abnormal wear on joints and cartilage, dislocation of the kneecap or shoulder, obesity, canine hip dysplasia, etc. There are number of different forms of dog arthritis but osteoarthritis, or degenerative joint disease (DJD), is the most common form of arthritis in dogs. Other forms of dog arthritis include rheumatoid arthritis, an erosive arthritis that occurs primarily in toy breeds and other small breeds. Actually, most dog joint problems can result from, or lead to, arthritis in dogs. Osteoarthritis in dogs can be defined as the progressive and permanent long-term deterioration of the cartilage surrounding the joints. The damage to the cartilage can become so severe that the bones come into contact with each other, making any movement extremely painful. Seeing their dog in pain like this can be very traumatic for the owner. Canine osteoarthritis can affect any joint in the body such as the shoulder, elbow, knee, hip, and back. The most common dog arthritis symptoms are swelling, stiffness, and joint pain. Ligament is a band of connective or fibrous tissue that connects two bones, or cartilage, at a joint. The cranial cruciate ligament (CCL), or anterior cruciate ligament (ACL), is the ligament that connects the bone above the knee (femur) with the bone below the knee (tibia). The cruciate ligament stabilizes the stifle joint (knee). Canine cruciate ligament can tear or rupture. This can happen suddenly (acute ACL), e.g. when the dog is injured during strenuous activity. However, sometimes it is enough for the dog to just stumble and rupture the ligament. Other times cruciate ligament injuries develop slowly over time, e.g. if the dog has genetic abnormalities that cause poor muscle tone. Ligament tear or rupture leads to joint swelling and instability in the knee joint. It is very painful and the dog will have problem walking. Most dogs with cruciate ligament injuries require surgery. All dogs can get canine cruciate ligament injury though some breeds are more prone than others, e.g. Labradors, Golden Retrievers, German Shepherds, and Rottweilers. Other risk factors include being overweight, unfit dogs engaging in strenuous activity, male dogs neutered before 5 months of age, etc. Damage to the canine cruciate ligament is a major cause of progressive osteoarthritis in the knee joints. Simply speaking, canine elbow dysplasia is development of arthritis in the elbow joint. Dogs suffering from elbow dysplasia are often lame or have abnormal gait. The symptom can range from occasional lameness to crippling arthritis. Canine hip dysplasia is one of the most common skeletal diseases in dogs and affects millions of dogs worldwide. Hip dysplasia in dogs is when the hip joints do not develop normally, i.e. the ball of the femur does not fit properly into the hip socket. As the disease progresses the dogs hip joints degenerate, causing the dog hip pain as well as mobility issues. Hip dysplasia can affect all dog breeds, but large and giant breeds are more commonly affected than smaller breeds. Environmental risk factors of canine hip dysplasia include rapid weight gain, pelvic injures, repetitive strain injuries, etc. Dogs can also develop hip dysplasia in later years with the onset of arthritic conditions (often referred to as later onset hip dysplasia). Various other diseases / conditions can cause dog hip pain or arthritis, e.g. cancer, hygroma (bursitis), Lyme disease, obesity, hyperparathyroidism. You should see your Vet a.s.a.p. 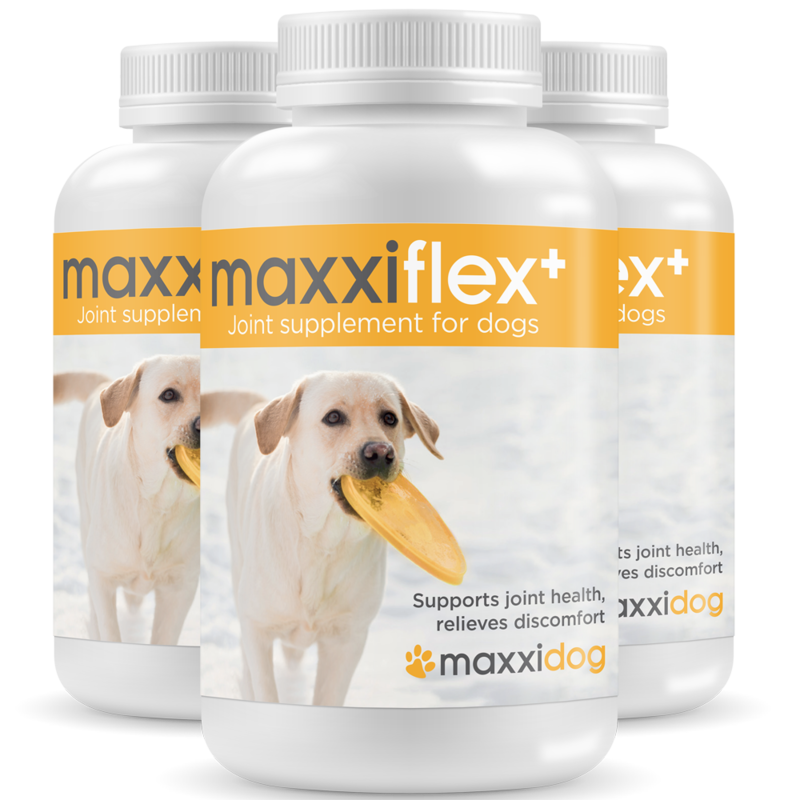 if you suspect your dog is suffering from any kind of dog joint health problems. The sooner you react, the better for your dog joint health and comfort.